Perfect for every baseball fan, here is the story of New York Yankees baseball great Joe DiMaggio’s longest hitting streak in baseball history. In the summer of 1941, Yankee center fielder Joe DiMaggio and his favorite bat, Betsy Ann, begin the longest hitting streak in baseball history. But when Betsy Ann goes missing, will DiMaggio keep hitting? Set on the brink of World War II, this is a spellbinding account of a sports story that united the country and made DiMaggio a hero, at a time when one was profoundly needed. 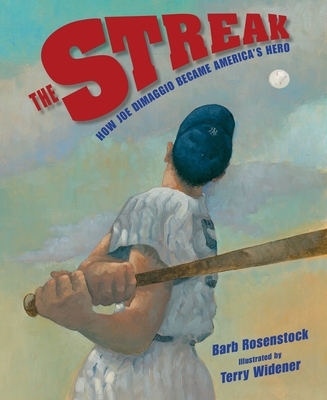 Barb Rosenstock's action-packed text and Terry Widener's powerful illustrations capture DiMaggio's drive as well as his frustration. The book also includes headlines, quotes, stats, and a detailed bibliography. Barb Rosenstock is the author of several award-winning nonfiction titles, including: Fearless: The Story of Racing Legend Louise Smith; The Littlest Mountain, a Sydney Taylor Honor Book; and The Camping Trip that Changed America, a Parents' Choice silver medal book and one of Booklist's Top 10 Books on the Environment for Youth. She lives outside Chicago with her family. Visit barbrosenstock.com. Terry Widener is the award-winning illustrator of more than thirty children's books, including Lou Gehrig: The Luckiest Man, a Boston Globe-Horn Book Award Honor Book, The Babe and I, a California Young Reader Gold Medal Award, and America's Champion Swimmer: Gertrude Ederle, a School Library Journal Best Book of the Year and ALA Notable Children's Book. He lives with his wife in Texas. Visit terrywidenerart.com.